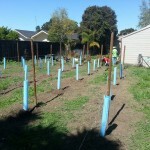 The vines are planted! 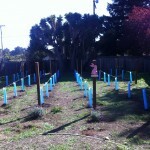 The vines are planted! 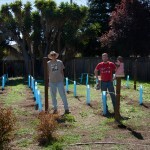 Thanks to the help of some wonderful friends and family we got 47 vines planted this weekend. The planting went really well. We had one set of two guys running the single person post-hole digger (which had a good bit and worked wonderfully this time). We then had two teams of two people planting the vines, and finally one person with a bucket going around and watering the new plantings with a mixture of H2O and vitamin B12. The B12 is important. 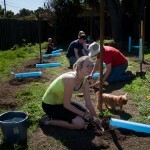 You are supposed to let the dormant vines soak in a combination of water and B12 for 12 to 24 hours prior to planting. This wakes up the dormant plants. Once the vines are in the ground, you add the same mixture to help them establish themselves. We used two person planting teams because there is more to getting the vines in the ground then just sticking the plant in the hole and covering it with dirt. 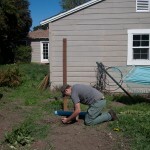 Once the plant is in the hole, you need to add a little dirt and tap that down. Then you pull up on the plant slightly, allowing the roots to straighten; and while one person holds the plant slightly lifted, the other adds the rest of the dirt and taps it down again. 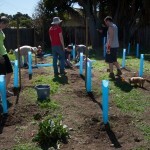 Once the plants were in the ground, we covered each one in a blue grow tube. It might not look too pretty, but the tubes should protect the plants from critters and should amplify blue light which increases beneficial photosynthetically active radiation. My only regret from the whole day was that I did not get a group photo of all the wonderful people who helped out. It would be nice to have a picture of all the people who helped out. Even though I do not have a group picture, here are a few photos taken throughout the day.